One of the great new features included in Visual Studio 2012 is the ability to create professional looking storyboards using Microsoft PowerPoint. Storyboards allow you to create very realistic mock-ups of an application using shape libraries designed for the particular type of application you are proposing. Examples include Windows application, Web application, Windows Phone 7 applications and more. Microsoft has released a number of new storyboarding shapes for people wanting to create Storyboards for iOS, iPad or iPhone applications. NOTE: To get the Storyboarding feature in PowerPoint, you must have one of the following products installed. Locate the “*.SBSX” file you downloaded in step 1 and click Open. 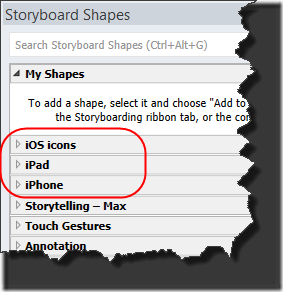 Your new storyboard shapes will appear in the Storyboard Shapes toolbox. If you want to learn more about how to use the Storyboarding features, consider taking our Managing Projects with Team Foundation Server 2012course. We have an entire module devoted to getting up to speed quickly.